It's called treating yourself — look it up! 1. A fitting but stretchy off-the-shoulder number that'll flow seamlessly into culottes or skirts for an elegant vibe you'll totally own in any occasion. Get it from Amazon for $13.96+ (available in sizes S–XL and 10 colors). 2. A cozy waffle knit top you'll be hard pressed *not* to buy in every color — because your wardrobe this winter should feel like your own super soft cocoon! The top is already pretty oversized as is, so no need to order up if you're aiming for a slouchy fit! Get it from Amazon for $15.99+ (available in sizes S–XXL, two sleeve lengths, and nine colors). 3. A casual striped tee that'll look equally cute lounging by the fireplace or out last-minute gift shopping — you know it's gonna happen, and you'll want something roomy and comfy to sprint around the stores in, trust. Heads up: this shirt runs large, so just keep that in mind! Get it from Amazon for $6.99+ (available in sizes S–XXL, two sleeve lengths, and six colors). Get it from Amazon for $18.99 (available in sizes XL–4XL and three colors). 5. 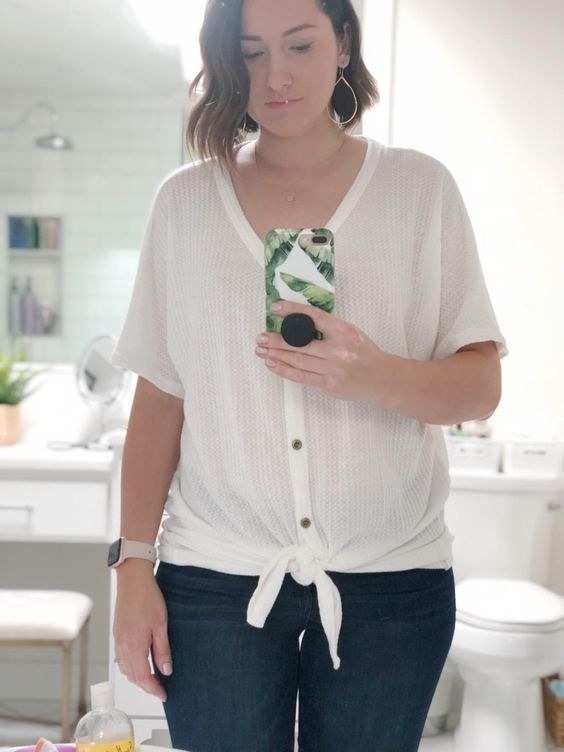 A Reese Witherspoon-approved* ruffled blouse that'll tuck perfectly into your favorite pair of jeans for the perfect, no-effort-but-incredibly-elegant look. *It's in collaboration with her clothing brand, Draper James! 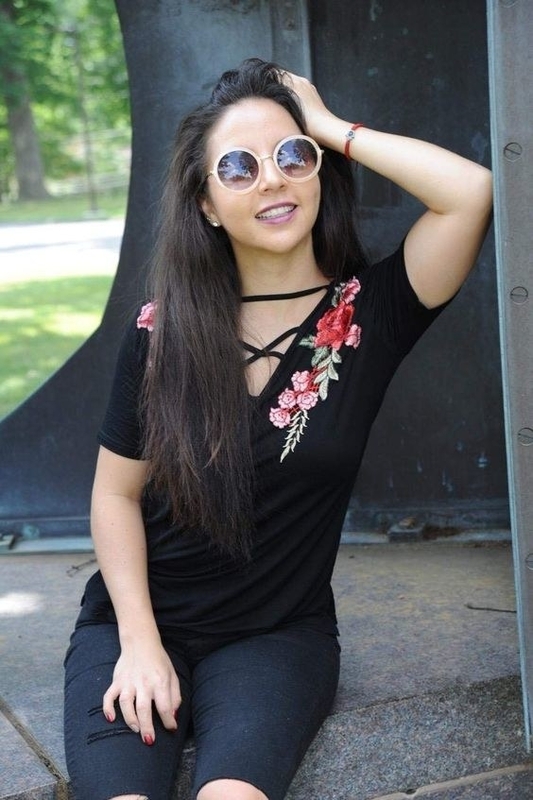 Promising review: "This top is so cute! The fit is great and it's a revelation to have a button-front shirt that doesn't gape!" —Mary O. Get it from Eloquii for $80 (available in sizes 12–28). 6. 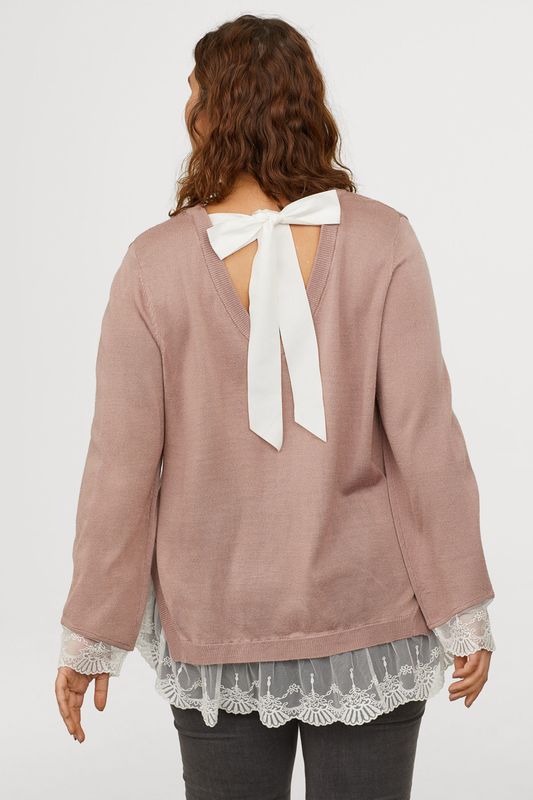 A romantic lace-trimmed sweater featuring a pretty bow tied at the nape of your neck, because sweaters deserve to be just as dressed up as your blouses! Get it from H&M for $39.99 (available in sizes L–4XL and two colors). 7. A fitted flared-sleeve number with plenty of stretch to its form — and not to mention, it can be dressed up or down in a snap. Test it out, I dare ya. Get it from Amazon for $27.99+ (available in sizes XS–XL and three colors). 8. 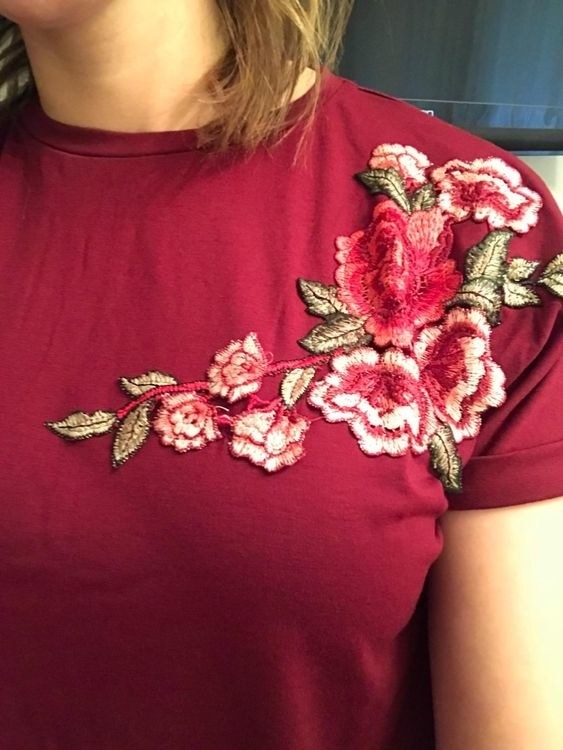 An embroidered beauty that won't leave you ~strapped~ for funds afterwards — so you can spend it on awesome gifts for other people like the selfless person you are...ok, and on gifts for yourself. Get it from Amazon for $7.99+ (available in sizes XS–XL, three collar styles, and five colors). 9. A gorgeous ombre v-neck tee to upgrade your burgeoning tee collection with a little bit of ~punch~ — it's like your second grade class project, but it looks way better. 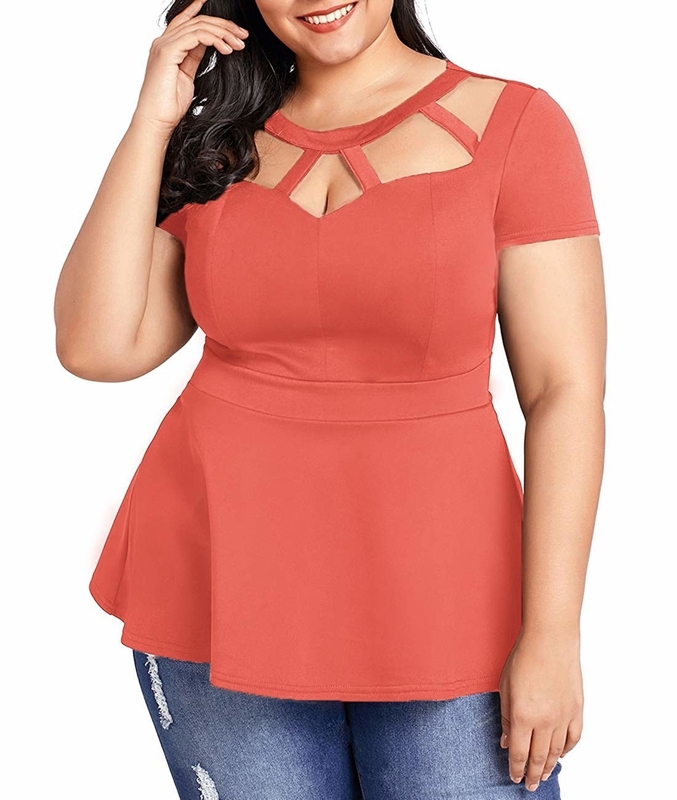 Get it from Torrid for $32.90 (available in sizes M–6X). Also available in a similar turquoise version. 10. A lovely checkered top that'll be easily to layer up with and comes with a cute bow that you can also do without, if your lewk calls for it — versatility is its middle name. Promising review: "The material is nice and thick, and the bow detail is just gorgeous on it. 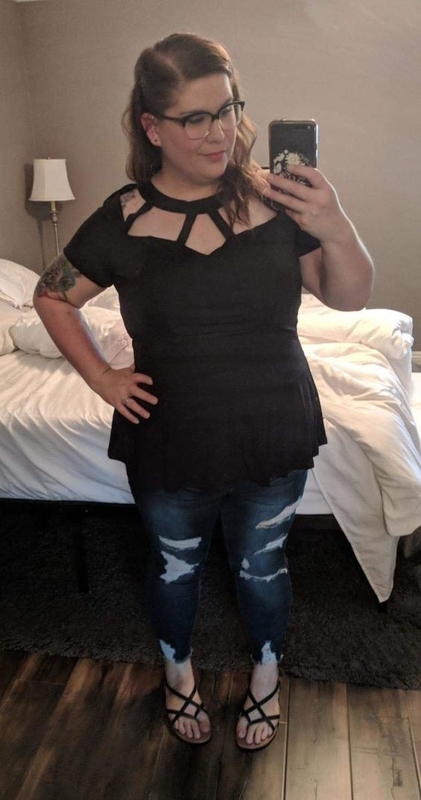 I normally wear a size small and ordered it in a size medium (which I normally do for this company) and it fit perfectly. The bow comes as a long strip of fabric that you wrap it around above your waist and tie it into a bow yourself. 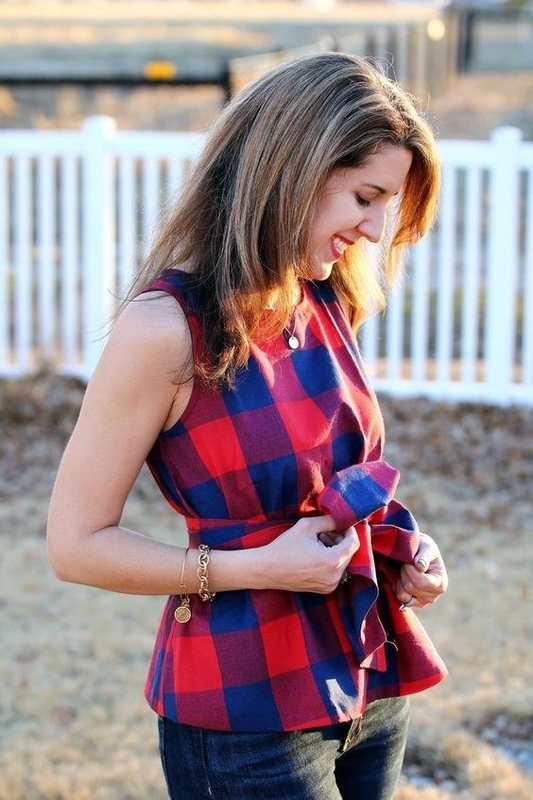 This is nice because you can wear the checkered tank with or without the bow. There are no loopholes that the strip of fabric for the bow goes through, but it stays in place well and makes the tank look even better if you do decide to wear it without the bow. I love layering a navy blazer over the blouse, since it is sleeveless and a bit chilly where I am. Definitely a versatile piece for ALL seasons. I'm really loving this top!" —Carrie A. Get it from Amazon for $14.99 (available in sizes XS–XL and three colors). 11. A relaxed-fit velvet tee you'll be tempted to wear multiple days in a row — to which I say, go for it — because something this good doesn't follow any fashion expectations. Get it from Nordstrom for $45 (available in sizes XXS–3X and four colors). 12. A back-bearing sweater fully responsible for the prolific use of the phrase "party in the back" — it has no regrets. Reviewers say that this top runs small, so size up! Get it from Amazon for $4.59+ (available in sizes S–XL and four colors). 13. A cute wrapover top that won't compromise style over comfort, which is really what we're all looking for in this life. Get it from Amazon for $15.99+ (available in sizes 16–24 and five colors). 14. A silky bow tie blouse to make you look extra polished, even when you're feeling a little rough on the inside (Mondays...through Fridays, I'm looking atcha!). Get it from Amazon for $14.99+ (available in sizes S–XXL, two sleeve lengths, and 28 colors/styles). 15. A darling ballet-inspired wrap top made out of the softest ribbed knit material known to man. Or just to me — but either way, it's just so darn pretty. Get it from Nordstrom for $49 (available in sizes XXS–XXL and two colors). 16. 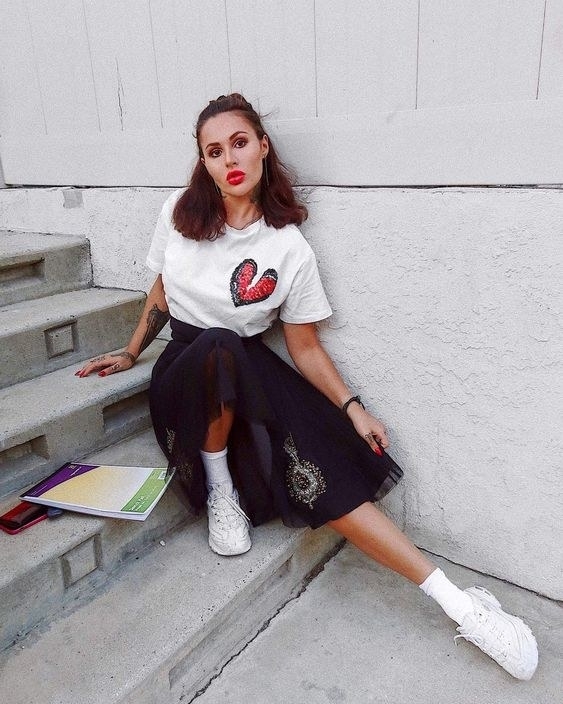 A graphic tee unlike your other ones — no band logos or cheesy quotes here, just tasteful designs like big waves and slightly broken sequin hearts (go along with it). Get it from Amazon for $5.99+ (available in sizes XS–XXL and nine designs). 17. A flirty ruffled open-shoulder top that'll pretty much be a Christmas *and* Valentine's gift to yourself — 'cause if you're not gonna be generous with yourself, then what are you even doing? Get it from H&M for $9.99 (available in sizes 0–18 and three colors). 18. 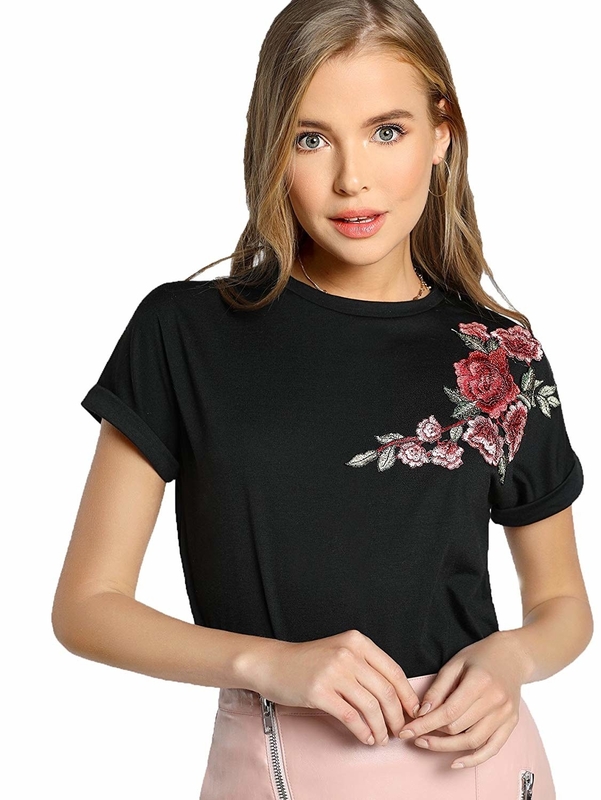 A dainty embroidered tee blossoming across your shoulder — because even though you don't have a green thumb, you'll be damned if your wardrobe doesn't! Promising review: "The embroidery is well-stitched and beautiful. 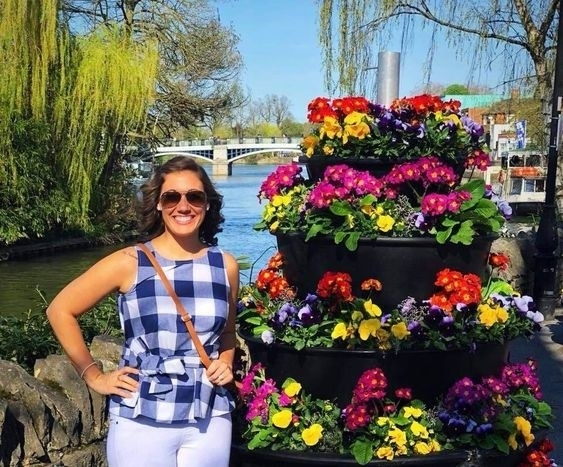 This is a casual shirt you can just throw on, but the flowers make it better than just a plain shirt — so you look fancier without trying." —Angela K.
Get it from Amazon for $12.99+ (available in sizes XS–L and seven colors). 19. A semi-sheer velvet floral dreamboat waiting to be ~showered~ with love and compliments, by you and everyone else. It needs a strong support system to be its best self. Get it from ModCloth for $59 (available in sizes XS–4X and two colors/patterns). 20. An asymmetrical chiffon blouse that'll hang low but'll always, always aim high — it's determined to make you "best dressed" in the office. Get it from Amazon for $29.99 (available in sizes S-XXL and in five colors). 21. A versatile solid *or* windowpane-style cropped blouse for endless pairings with all of your high-waisted jeans, trousers, skirts — it requires a lot of wear and attention, just sayin'. Get it from Amazon for $15.99+ (available in sizes S–XXL and 12 colors/styles). 22. An off-the-shoulder boho-inspired blouse ready to up the cute factor for every single outfit you don with it. Solid top? Don't know her. Get it from Amazon for $22.99 (available in sizes S–2XL). 23. An adorable cactus tee that'll want to hug your body, contrary to popular belief — it's often misunderstood due to its pricks, so it's up to you to show it some love! Reviewers say that this tee runs small, so size up if needed! Get it from Amazon for $14.99 (available in sizes XS–XL). 24. A lace-trimmed camisole you'll be pulling off the rack for just about every outfit. Think of all the layering possibilities! Hello, flirty and thriving! Get it from Amazon for $39 (available in sizes 1X–3X and two colors). 25. A charming striped knit you can definitely find filed under "cozy as can be" in the winter fashion dictionary. 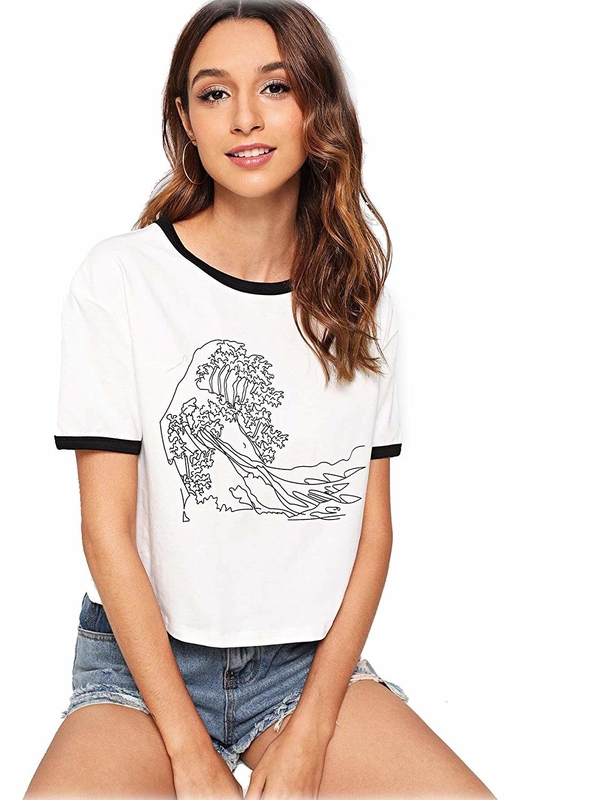 Get it from Urban Outfitters for $44 (available in sizes XS–XL and 14 colors/styles). 26. And a fanciful lace thermal top whose favorite song is definitely "Baby, It's Cold Outside." Except it'll actually dare to venture outside — any excuse to cuddle up with you! 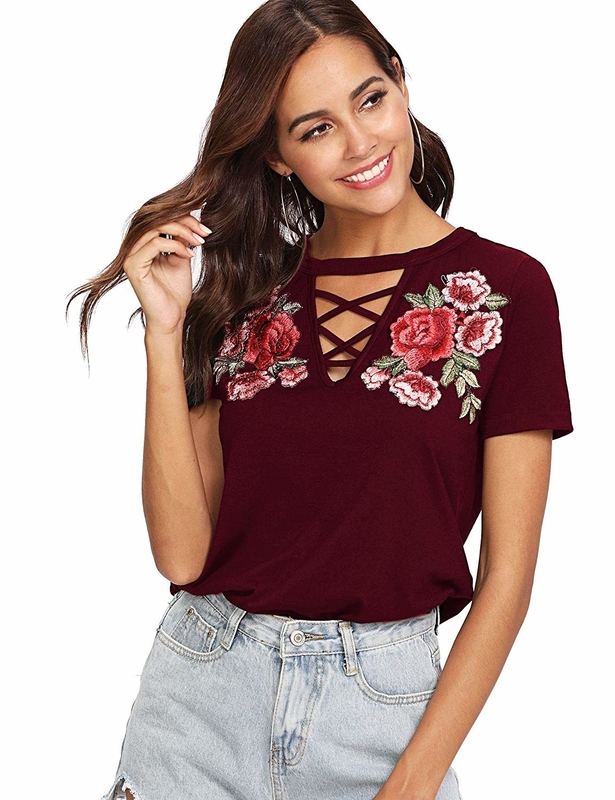 Get it from Nordstrom for $78 (available in sizes XS–XL and three colors). Now all that's left to do is STRUT YOUR STUFF.